My skin is very important to me and it is my belief that your appearance speaks a lot about who you are. As I have discussed several times I don't wear makeup which really gives me no options for hiding my flaws, the only options I have are to take care of my skin. 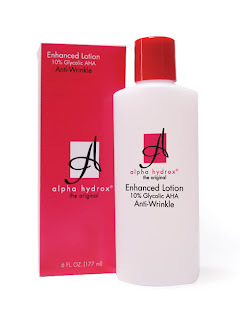 recently I was given the chance to review a product called Alpha Hydrox 10% Enhanced Lotion from Neoteric Cosmetics. This lotion was designed for all skin types to help exfoliate skin, reduce the appearance of fine lines and wrinkles, and even skin tone and texture and unclogging pores. When I received this product I was aware that the first couple of uses may cause some "tingling" while I probably would refer to it more as a burning sensation it did infact go away after 5 uses. I am glad I pushed through the first couple of days, since then I feel like my skin has really become smoother. There is very little smell to this product which I loved because I usually have a reaction to perfumed products. Being a mother of three my first thought when I read about get rid of lines and wrinkle is my stomach! Now I know that this product was not made for stretch marks but I have been applying it to my stomach for the last week(which really didn't burn but the first two uses) and it is really making my skin feel great! The bottle is a great size at 6 ounces I have had plenty to use for both my face and stomach. The price is pretty nice to only $10.99 it is an affordable way to improve any skin. Head over to the Alpha Hydrox Facebook page HERE where you can find more great information and fun.